Now is a great time to use Venus, which is unmistakably bright in the Western sky at sundown, to identify a pair of stars: Polllux and Castor. The three objects are nearly in a line Friday night, June 11 (shown here). On subsequent nights, the stars will move lower and away from Venus. On June 14, a thin crescent moon will hang just below Venus. Venus appearsso dazzling that it's now capturing the gaze of countless millions soonafter sunset, and this week for those situated north of the equator it willappear to stand higher in the western twilight sky than at any other time thisyear. Weather permitting, this brilliant lantern-like planet willshine more than 25 degrees high at sunset and still about 15 degrees above thehorizon as the last bit of twilight glow fades. For comparison, your fistheld at arm's length covers roughly 10 degrees of the night sky. What is unusual is that while Venusis now at the pinnacle of its evening visibility, its greatest elongation(angular separation) from the sun is still more than two months away, in lateAugust. The reason for this paradox can be traced to the differencein declination between Venusand the sun Declination is a coordinate on thecelestial sphere, and is analogous to latitude on the Earth's surface. Thedeclination of an object is how many degrees it is north or south of thecelestial equator. Right now, Venus and the sun arepositioned about 23 degrees to the north of the celestial equator, which isabout as far to the north as either object can appear. But in the coming daysand weeks, Venus will appear to slide rapidly toward the south, causing it toappear to steadily lose altitude in the sunset sky. When it reaches its greatestelongation from the sun on Aug. 20 it will be nearly 20 degrees south of it indeclination. So it will be noticeably lower in the sky at sunset, as well asappearing to set more toward the south of due west. And since both the sun and Venuswill continue to head south through the balance of summer and on into the fall,Venus will become increasingly more difficult to see. By October, it rapidly sinks outof sight; from mid-northern latitudes we'll have to struggle to catch it verylow in the west-southwest soon after sunset during the opening days of themonth. Venus will become hopelessly lost in the glare of the sun shortlythereafter, as it falls past it ? inferior conjunction ? on Oct. 29. But at least for now, eveningviewers are seeing Venus at its very best for 2010. Skywatchers using their unaided eyes and binoculars will seesome dramatic Venus conjunctions (when the planet appears near another object) duringthe next couple of weeks. 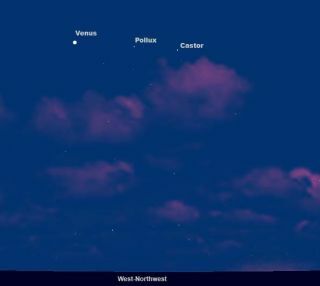 In the dusk of Friday evening, June 11 for instance, Venusstrikes an interesting pose with the "twin" stars, Pollux and Castorin the constellation Gemini, forming a nearly straight and horizontal line inthe sky. While they won't appear exceptionally close, Venus and thatslender sliver of the moon will still make for a pleasing tableau in thatMonday evening's west-northwest sky, Venus appearing to ride well above andslightly to the right of the moon. Then Venus continues on a beeline toward the Beehivestar cluster (M44) in faint Cancer, the Crab, arriving there during theevenings of June 19 and 20. Wait until about an hour after sunset and use binoculars ora wide-field telescope to detect the cluster as a faint sprinkling of starsjust to the lower left of Venus. On June 18 Venus will be just 1/2 a degree northeast of 5th magnitudestar Eta Cancri. It will be at the northwest edge of the Beehive the nextevening, and at the northeast edge of the cluster the night after that. Normally, the Beehive is visible to the naked eye as a hazyspot of light, but right around these nights the close proximity of Venus willlikely overwhelm any chance of spotting the cluster without optical aid. You should be able to detect the small, dazzling,yellow-white gibbous phase of Venus in your telescope if the atmosphere is calmand you observe as early in twilight as possible, before Venus has sunk toonear the horizon. And on June 23 Venus will stand about midway between thestars Pollux and Regulus. Not a few astronomy texts and stargazing guides will tellyou not to bother looking for Venus at midnight, since it always sets within afew hours of sundown and is usually long gone from the sky by the middle of thenight. However, this week, since we are getting near to the time ofthe summer solstice, the sun appears to be setting practically as late as itcan set. In addition, most parts of the United States and Canada are now ondaylight saving time. As a consequence, even though it's setting only about 2 1/2 hoursafter sunset, Venus is setting rather late for most places: generally withinseveral minutes of 11 p.m. local daylight time. However, if you live near thewestern boundary of your local time zone or at a latitude north of 45 degrees,Venus will be setting close to, or even after the stroke of midnight. From Indianapolis, Indiana, for instance, Venus will set at11:47 p.m. EDT. From Winnipeg, Manitoba, Venus will set at 12:09 a.m. CDT. And for Houghton, Mich., Venus doesn't set until 12:22 a.m.EDT, while those who live in Edmonton, Alberta can enjoy their view of Venusuntil well past 12 midnight ? 12:33 a.m. MDT to be exact! Joe Rao serves as an instructor and guest lecturer at NewYork's Hayden Planetarium. He writes about astronomy for The New York Times andother publications, and he is also an on-camera meteorologist for News 12 Westchester, New York.